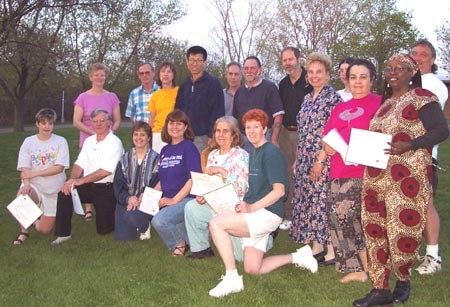 On May 1, 2001 Instructor Lu Chunei awarded the 42 Form Tai Chi Class their promotion certificates. The group which included Shihan Cyndy Jones trained at SUNY Brockport. Prior to learning the 42 form, the group studied the 6, 12 and 24 Taichi forms. Mr. Chunlei Lu is a visiting National Scholor from China who has been teaching Tai Chi and Chinese philosophy at SUNY Brockport for several years. His students including Shihan Jones consider him to be an excellent teacher. In addition to teaching, Master Lu has made nine videos tapes covering not only the various aspect of Tai Chi but also Qi Gong and other Chinese arts such as Xiang (Fragance) Gong. Shihan Jones hopes to teach a 6 Form Tai Chi class at Collamer-Jones Karate in the future. In the mean time, if you would like some information on Master Lu's Tai Chi tapes or classes you can email him at LUCHUNLEI@YAHOO.COM. You can also email Robert Loughridge for information at Robertloughridge@Yahoo.com.